Egypt is opening its border with Gaza to humanitarian aid and relief. The move comes as Cairo, along with its neighbors in the Middle East, continue to condemn Israel's deadly raid Monday of an international aid convoy to the Palestinian territory. 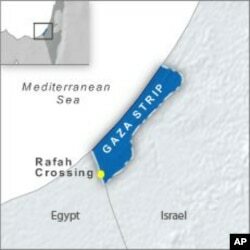 President Hosni Mubarak ordered security at the Rafah border crossing to allow aid to enter Gaza, and to let Gazans in need of medical treatment to leave. The move follows Israel's violent interception Monday of 10,000 tons of supplies bound for Gaza aboard an international aid flotilla. Egypt, for the most part, has kept its border with the Palestinian territory closed since Hamas militants came to power in 2007. Fahmy Howeidy, a prominent Egyptian columnist, says it is not clear how long or how inclusive the new border opening will be. "I can imagine that President Mubarak and Egypt are embarrassed now because there is international pressure now to open borders. And he knows, and all of us know, that he is participating in the closing borders and is participating in the siege," Howeidy said. Other Arab nations have condemned Cairo for blocking the Rafah crossing, in particular during the Israel-Gaza war last year. Under previous peace negotiations, Egypt has international obligations to regulate the border. Despite the criticism of its neighbors, the Egyptian government is believed to be building a wall to cut off the smuggling tunnels used to transport goods and, Israel alleges, weapons to the territory. Anger at the Israeli raid continued for a second day across the Middle East. In the Yemeni capital Sana'a, tens of thousands of people joined in a government-led protest. Three members of Yemen's parliament were among the hundreds of people in the aid convoy. In Iran, President Mahmoud Ahmadinejad again spoke out against the raid and the country that he has repeatedly said will not last. The Iranian leader warned Israel about any aggression, saying a "storm of anger from the nations of the region will uproot you." The Arab League is holding an emergency meeting in Cairo Tuesday to discuss what action it will take.